Racing Brake Ultra Disc Brake Lube - Dezod Motorsports Inc - Home of the automotive performance enthusiast since 2002. 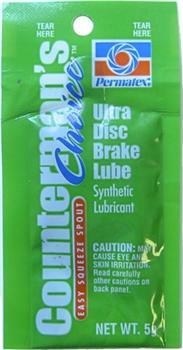 Ultra Disc Brake Caliper Lube is a green, environmentally friendly, non-melting, pure synthetic lubricant. It is formulated to lubricate under the most adverse brake conditions, assuring that critical caliper pins, sleeves, bushings and pistons remain lubricated throughout pad life. Ultra Disc Brake Caliper Lube, that is water and corrosion resistant properties, is excellent on rolling and sliding surfaces operating in wet or dry conditions from -40°F (4°C) to +400°F (204°C). It is compatible with internal and external brake rubber and plastic hardware, including ethylene-propylene rubber. Wirebrush the caliper housing and anchor plate to remove all dirt and dust. Apply Permatex Ultra Disc Brake Caliper Lube to all moving caliper hardware, mating surfaces and steel backing plates of the disc brake pads.